Founded in 1874, SUNY Maritime College is one of six state maritime academies in the United States focusing on Engineering, Marine Environmental Science, Marine Transportation, Maritime Studies, and Business. Many of our classes teach the vital skills and knowledge you will needto enter these fields through a focus on the transportation industry, especially commercial shipping and logistics. On a narrow peninsula borderedby the Long Island Sound and the East River, our 55-acre campus in New York City is the perfect place to learn through our specialized academic courses and offerings. From here you will have access to top internshipsand real-world experience, industry experts, leading faculty, and a dedicated alumni network. 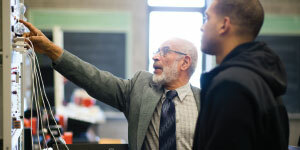 The College is one of the best in the Northeast, according to The Princeton Review, and a top university in the North, according to U.S. News & World Report. The College is also among the top 30 schools in the Northeast for “Best Bang for the Buck,” according to Washington Monthly. 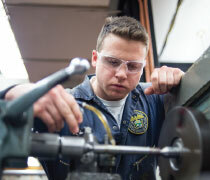 Approximately 70% of our students are working toward a joint bachelor’s degree and US Coast Guard license. A license qualifies you to sail aboard a commercial ship, similar tothe way a driver’s license allows youto drive a car, and does not require military service. Part of earning a Coast Guard license means you willbelong to the regiment of cadets, a disciplined lifestyle program. The regiment is also open to students who arenot interested in earning a license. 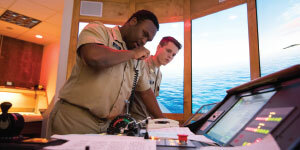 License students spend their summers sailing around the Atlantic Ocean and Mediterranean Sea on the College’s 565-foot training ship, the Empire State VI. Our other students follow a more traditional path, earning a bachelor’s degree and having opportunities tostudy abroad, participate in internships, and enjoy all the other campus-life activities Maritime has to offer. Whichever path you choose, SUNY Maritime will help you set yourself up for success. From here you can sail on a commercial vessel, operate a power plant, design and build ships, restore ecosystems, or even fly into outer space like our alumnus Captain ScottKelly ’87.